You're IT Candlewood Market Coffee & Tea Emporium! Three questions with Tony Inzero, owner of Candlewood Market Coffee and Tea Emporium. 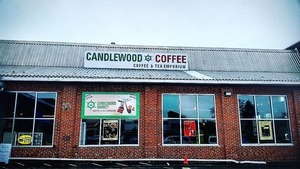 Candlewood Coffee has been in business since 2009 which makes this our 10th year anniversary. Being a family run business, several family members expressed their desire to share our brand through a coffee house because they really wanted the interaction of the customers. Hence, we started Candlewood Market Coffee and Tea Emporium. It’s now exactly 1 year since we opened the Market, and I must say the best part about it is the personal interaction that takes place within our shop. It makes every day much more exciting and flavorful! Our best selling product is by far all of our coffee based products. Our Deep waters Dark roast and Smooth Sailing Medium roast lead the pack with several signature flavors Like Noccionella (chocolate cinnamon & hazelnut). Because we know the difference between coffee, whether it be stale, fresh, burnt, or flavorful, our customers are also able to discern quality coffee, making our shop part of their daily grind..so to speak. I hate to pick out coffee as our best product because everything we do in our shop is top notch, including many local vendors supplying baked goods, chocolates, and kombucha. But coffee is definitely our forte. I wish I could communicate to as many coffee drinkers & non-coffee drinkers the differences between Stale and fresh roasted coffee…and the differences between burnt coffee and a really flavorful coffee that needs no sugar or cream! Stale coffee is like sipping a cup from an old musty attic as opposed to sipping a cup over a raging campfire in the rainforests of Papua New Guinea. The difference between flavorful coffee and burnt coffee is like onions lightly sauteed in butter and garlic, or the same dish left on high for 30 minutes until the smoke alarm goes off! Candlewood Market is located at 85 Mill Plain Road in Fairfield. Visit Candlewood Market online here. Candlewood Market Coffee & Tea Emporium tags Double Up Dance Studio!